Stained glass has not, or had not, it seems, given such satisfying results in the creation of new work as in the restoration of the old. French glassmakers are absorbed too much by maintaining the stained glass of our cathedrals: they excel in this, but the imitation of ancient models leaves them neither the time nor a taste for innovation. Let us make an exception for G. Décôte, whose cartoons for Fourvière and for the Church of the St.-Sacrament of Lyon we saw, and let us also note the names of Messrs. Henri Carot, Gaudin, Laumonerie, Socard, Gsell-Maury, Tournel. 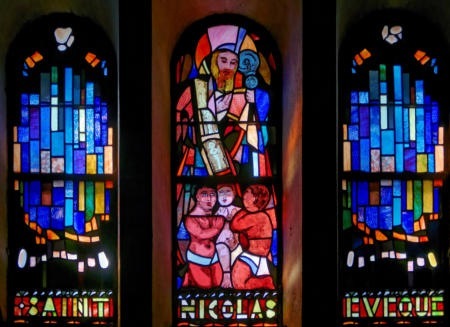 In Switzerland, on the contrary, without mentioning the dazzling stained glass windows of the Polish Mehoffer at the Collegiate church at Fribourg, artists of the romande tendency, of very French culture, Messrs Alexandre Cingria, and Marcel Poncet, have created, at Nôtre-Dame and at St. Paul in Geneva, windows of shining colour, remarkable for their invention and technique. Printing, which has its own considerable importance, has ceased being an original art. It has become, as with engraving in general, an art of reproduction. In 1911, it was represented by Messrs. Azambre and Breton. It would benefit greatly from a return to artistic and typographic procedures as practiced by the ancients, procedures such as woodcut and engraving with a burin. Lacking those classical procedures, employed by artists with their own hands, we should reproduce, as has André Marty in a very impressive manner, facsimilies of artists’ drawings, instead of giving to this type of production a uniform, tedious and sadly photographic aspect. Much better results have in the meanwhile been obtained thanks to L. Rouart, and to the talents of Messrs. Robert Bonfils, Carlègle, etc., and from master engraver J. Beltrand. 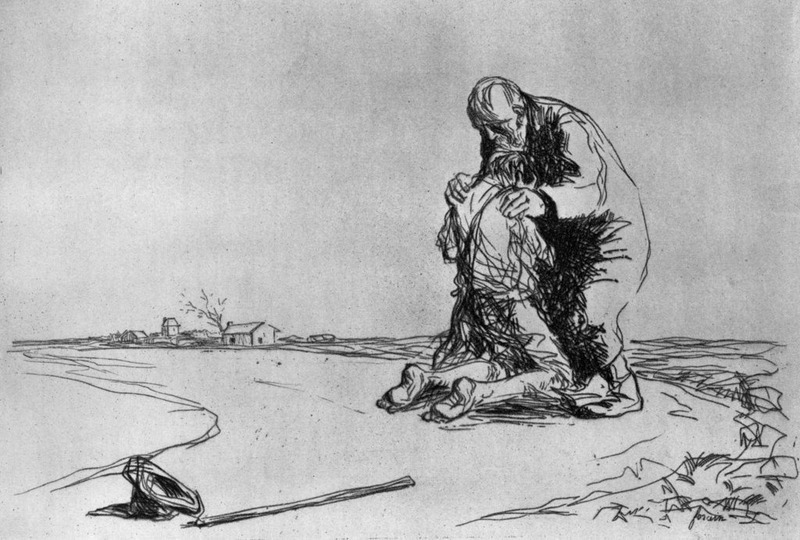 It is true that by 1911 we had, apart from Beltrand's admirable woodcuts, etchings by Bouroux, Marcel Roux, Bernard Naudin, and above all the Disciples at Emmaus, the Good Samaritan, the Despoiling of Christ, by Forain, plates worthy of Rembrandt, magnificent examples of truly modern and truly Christian art. Goldsmithing, putting aside the chalices and the crown of Sacré-Coeur by Bourgoin, had nothing comparable to the submission of Jean Brom from Holland, which, despite an excessive ornamentation, was worth more than our perpetual pastiches of ancient styles. In vestment-making, Mlle. Sabine Desvallières exhibited some remarkable and very original embroidery. A pupil of Mme. Ory-Robin, she was inspired by the spirit, not by the letter of the reforms that the Benedictines have attempted in work of this kind, which has to observe precise requirements imposed by the liturgy. Since then, still at the Pavillon de Marsan, we have seen very beautiful and abundant examples of this feminine art. The women’s workshop of the Union centrale , under the enlightened influence of Mme. Carnot, and other workshops founded after the war to furnish vestments to devastated churches - the Benedictines of the rue Monsieur, Mme Ory-Robin, and, finally, Mlle. Desvallières - have made of vestment-making an original art, renewing both its procedures and its originality. This is one of the most triumphant manifestations of the ingenuity of Frenchwomen, of their good taste and their artistic activity during the great war. Textile-art, as represented by the silk brocades of [Jules] Coudyser, manufactured [?édité] by Cornille, is deserving of equal praise. There was an interesting collection of medallion-makers, from Ponscarme and de Roty to Lamourdedieu and Barrilet. But what shall we say of sculptors? Most have made only the rarest incursion into the domain of religious art. There are Christians who are sculptors, and there are unbelievers who from time to time do work for the churches. We know two noble figures of Joan of Arc by Bourdelle, bas-reliefs by Camille Lefèvre, a St. Francis by Mme Besnard, figures by Pierre Roche, responsible for numerous decorative motifs at St. Jean-de-Montmartre, statues by Bourgouin, Quilivic, Saint-Marceau, Mlle. Thiollier, R. de Villiers, Castex, Croix-Marie, Charlier, Py, they are all specialists in the field. We await impatiently a work of religious sculpture which would be as remarkable in plastic originality as it is in the feeling expressed: up until now we have seen nothing in modern art, that would be the equivalent of, for example, a painting by Desvallières. I would go so far as to say that it is of work of this kind that we have the most need; a church can do without paintings, but not without statues. The piety of the faithful demands one for every object of devotion. It is certainly a disheartening problem for an artist to create a model that will be mass-produced, enlarged, shrunken, painted garishly, for use anywhere. It is quite another matter to translate into an original style attitudes, drapery, and expressions already fixed by tight conventions, to renew them without shocking the habits of the faithful, more demanding here than they are in matters of painting. To renew subjects such as Our Lady of Lourdes, Saint Anthony of Padua, the Sacred Heart, we lack a man of genius. But if we consult the example of the ancients, we can see that the principal remedy for this crisis is to renounce the creation of "models". Sculpture associated with architecture - statuary, or, better still, bas-relief, made expressly for a given place - that would already introduce us to the discipline of the work and of logic.